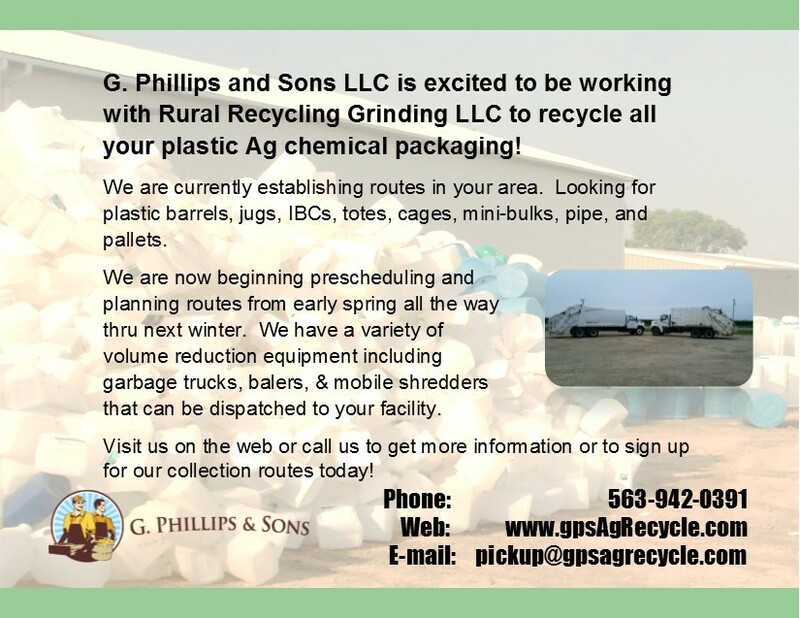 G. Phillips and Sons (GPS) will coordinate the collection and recycling of used crop protection containers in Nebraska. GPS has been contracted by the non-profit Ag Container Recycling Council (ACRC) to recycle the plastic containers in Nebraska. GPS will pick up these containers and process them at a service center. The ACRC recycles plastic containers made from high-density polyethylene (HDPE) only. HDPE containers are marked with the plastic resin code #2. See more about acceptable containers from the ACRC. Ensure containers are properly prepared for recycling with ACRC's Container Preparation Checklist. There are four types of site schedule in Nebraska. The choice of which schedule is maintained depends on the wishes of each collection site's management at the local level. GPS will coordinate with each State/Ag organization and collection point to schedule pickups. 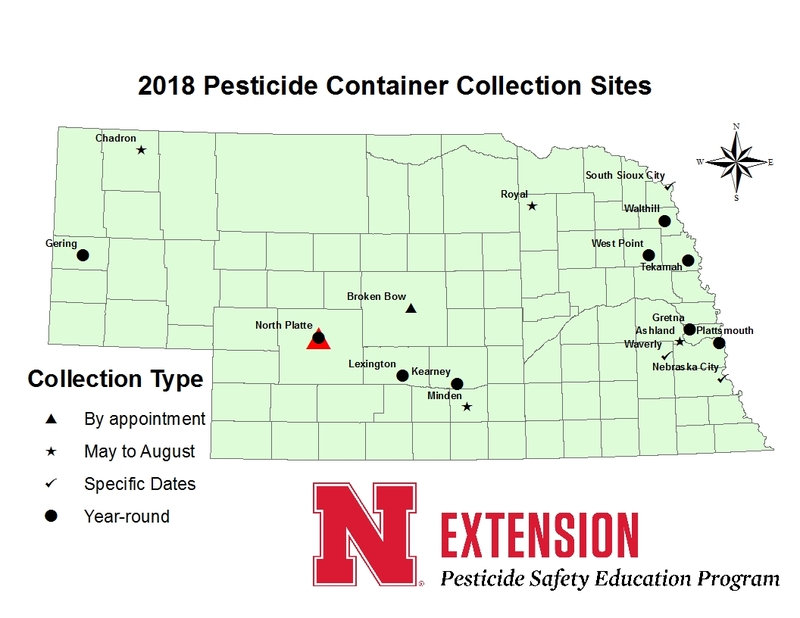 Collection sites and applicators will be notified 48 hours before their scheduled date. A very tight control of inventory is required in this recycling activity. Inspections are fundamental to ensure that high-quality containers are accepted. This recycling program cannot sell plastic to the industry for recycling due to low demand and market value. Instead, the national coalition of pesticide manufacturers underwrites the expenses in many states to inspect the containers a second time before acceptance, then takes possession of the plastic, transports it, grinds it, and arranges for its recycling into the plastic industry. A site's coordinator and contractor's agent will be responsible for inspecting and approving the condition of containers for pickup. At least 1,000 lbs. of containers must be collected before being picked up. If a site has collected collected fewer than 1500 containers, GPS suggests consolidation with another collection site, or continued storage until the 1,000 lb. threshold is met. A plastic tarp is spread on the ground. Upon arrival, the containers/drums are moved from the vehicle to the tarp. The inspection process takes place on the tarp. Accepted containers are placed into 4-mil, 275-gal plastic bags*, and put into temporary storage. Rejected containers are set-aside on the tarp until all the containers are inspected and then are placed back into the vehicle. Rejected containers remain the property of the vehicle's driver. *GPS provides 4-mil, 275-gallon plastic bags for collecting containers smaller than 5 gallons. The bags hold about 40 2.5-gallon containers (~30 lbs.). Larger containers will be loaded loose.